Another day, another post, my Puddlers. It is getting cold outside and when you start feeling lonely, when the bitter winds of winter make you not want to get out of your bed or turn off the TV, then you might as well forget about having any kind of social life, keep the TV on and prop your laptop in front of your face with this blog right in your face. Then, you can scroll through all of this terrific "cold-weather" content while getting crumbs of your favorite snack all over your dirty sweatshirt and learning valuable lessons about life - while staying far-removed from it. I'm there for you. I will have the tweaked Puddles of My Podcast Episode 26 up for you later this evening. However, now a man with some actual real intelligence and valid opinion is here to weigh in. It's Tuesday, so here is Alex Ramsdell with another entry into "In The Heart of The Heart of My Bookshelf." It seems like Network TV sit-com has reached a level of sophistication that is in many ways reflecting its audience more carefully and successfully. The laugh track is gone, the mechanics are lean, the humor is quick and current and the stage can go anywhere. The result is that the scope of the show--the degree to which it escapes from the humdrum of its location and still hooks you--is becoming more and more involved in its audience's demand to be entertained in a sophisticated manner. In 30 Rock, there are at least three sub-plots and a slew of recurring character-based motifs going on in each episode. There is a “massiveness” to a show like this and it somehow lives within the boundaries of the mundane. It may be appropriate to call it hyper-mundane, for the sophistication lies in its laborious and formally supercharged way of expressing the working week of a few network television employees. I must admit, I took to 30 Rock immediately, but have come to enjoy it less so, or I should say that I like it the same, but feel the urge to watch it less. The quality of the writing has always been stellar. It's the formal aspect: the rapid cuts, the quick, reference-laden dialogue, the general degree to which the show is prevented from pause. There is no rest, and in this way it does reflect its audience. I would venture to say that you won't catch someone actually breathing at all on 30 Rock, unless it is part of an explicit joke poking fun at Liz Lemon's weird way of breathing. This seems significant to me. The fact is, I don't watch 30 Rock nearly as much any more because it reminds me that I'm watching a television show, meaning that I'm consuming my time with these teeny little scenes all jammed together, which don't really seem to add up to much or sustain themselves in my mind after the episode is over. The show reminds me of novelty. Isn't the virtue of diversion-by-network-TV its capacity for entertaining you with consequence-less and implausible comedic situations? The fact that 30 Rock is first rate for its time doesn't diminish the fact that the machinery of its delivery is so rapid that you don't have time to think before the next scene arrives. Over time, this rapidity brings about not a sustained sense of reality to its situation, the NBC network, but a kind of extra-situational annoyance: hypermodernity. The kind of truncated, pause-less beating of the heart of everyday life from which there is no rest: at work, in the street, on the phone, on the internet. Let us hearken back to the year Y2K, when Malcolm in the Middle announced to the world a particularly goofy inflection of life's major lesson, chiefly that "life is unfair." It ran with this maxim for six seasons, involving us to the full extent in the hermetic politics of a middle class suburban family. Though the story is told through the perspective of Malcolm, an overly-intelligent but still bone-headed middle child, it finds a way to encompass a family's strange way of coping with one another through various modes of conflict, such as kid vs. parent, men vs. mom, brother vs. brother, and father vs. son. One of my favorite episodes is "Red Dress," a classic “sons vs. mom” episode, in which Lois (Malcolm's mother) buys a dress for her and Hal's (Malcolm’s father) anniversary and later finds the dress in the toilet, seemingly having been burned and hidden in a moronic fashion. What proceeds is a pastiche on political interrogation in which Lois puts the three boys, Malcolm, Reese, and Dewey, through military style divide-and-conquer examination in an effort to elicit the truth about the dress. We find her at first coaxing them with "name brand" orange soda, a substitute for conventional cigarette at the interrogation table. When they don't give in, she forces them to make themselves dizzy by spinning around in circles with a baseball bat - a benign substitute for various kinds of forced confession techniques. Eventually, she threatens to take a meat club to the television, which is ultimately a substitute for using the well being of a loved one as incentive to reveal information. The boys are only saved by a neighbor who hears their horrific screams - a testament to their love for the television - and comes to the door. In the time that it takes Lois to turn him away, Malcolm, Reese and Dewey have already hidden the television. Throughout the episode, the boys rely on their older brother Frances to combat their Mother's rigorous procedure. Frances has been sent to military school for having pierced his nose multiple times in spite of his mother's warning that she would send him away if he did so. Being the oldest son, and thus the most in conflict with Lois, Frances has a wealth of experience to draw upon in advising Malcolm. Yet, Lois emerges the most cunning, as she catches Malcolm and Frances on the phone planning how to get out ahead of Lois. The show takes commonly experienced methods of American suburban inter-family justice to the level of pastiche, using extended genre tropes sometimes, and other times indulging in the elliptical logic of kids. Sometimes you cringe, and other times you marvel at its genius. There is a moment, at the point where the brothers are completely at a loss with how to top Lois, when Reese pinches Malcolm in an attempt to get him to use his brain and make a plan. We find the results of Malcolm's plan leaving them with pillows and flashlights duct-taped to their bodies with buckets on their heads: nonsensical, astute and maybe successful. 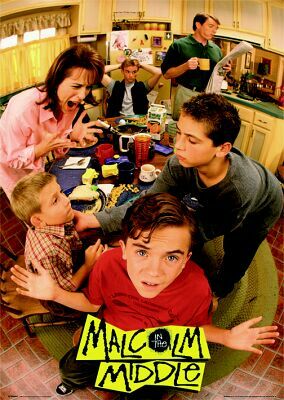 I ultimately enjoy Malcolm in the Middle because of its sustained thematic development of Malcolm and his family. The story ventures outside of the family, but not as a habit, and with the end of illuminating its characters more completely. It's not a work of cinematic genius, though it involves almost any camera trick ever used-- but it does hit at the heart of my childhood: the weird rules my brother and sister and I instituted, the overall deflection of responsibility at all costs. I suspect that one of the reasons Malcolm in the Middle didn't garner the same kind of sleeper popularity as a show like Freaks and Geeks did is that most of us would rather forget--or indeed have forgotten--the years the show takes up as central: the ones right before junior high, when the world was still seen through the prism of family. They were ugly years because we were at the pinnacle of submission to our parents' “cheesy” and restrictive norms. We might have rebelled against them, but it wasn't on principle, it was more ad hoc rebellion: they just didn't let us watch Return of Chucky. But when we weren't fighting, we genuinely spent time together and liked it - not that we would admit it.